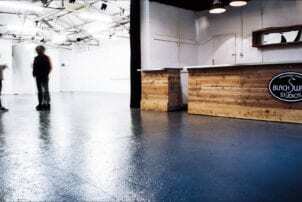 Black Swan Studios are a 3500 sqft ex silk warehouse, set just off Bermondsey Street (behind the Fashion and Textiles Museum) – a 5 minute walk from London Bridge. They have a permanent bar area which can also double up as a kitchen area. They also have a premises license enabling them to serve alcohol until 11:00pm. There are 4 toilets (including access and baby changing facilities) and the warehouse is wheel chair accessible. By day the studio is naturally lit by 6 giant sky lights, and by night benefits from a fitted ring truss with 10 RGB LED Colour Changing Floodlights, 6 Euro Light Par Cans and 4 RGB White-light Floodlights. The studio can also be blacked out. As well as the fitted lights the studio also has a selection of audio visual extras. They can also help you find any extra services you may need, and offer fantastic trade discounts with their preferred suppliers. They have spent a long time hand picking these to offer you the perfect solution to your event and have close relationships with everyone they work with. Whether you are looking for a boutique artisan caterer, or full production assistance, they have someone who can help. Alternatively if you are looking for more of a DIY event they can advise you on doing these things yourself. All of their quotes are bespoke, based on your exact requirements and the time of year of your event.